Did you know that in France, before drinking, you have to wait for everybody’s drink to be on the table? Even in a restaurant. Here are my 7 tips on how to “politely” drink wine the French way. Once everybody has been poured a drink, the host, or a guest, then may – or may not – raise his glass to a toast. If this happens, you have to drink, even if you just moisten your lips. It’s rude not to. And if your host doesn’t give a toast, then you may drink as soon as he has started. But in any case, French people will always wait for everybody to have a full glass in front of them to start drinking. or “à votre santé” (to your good health) answered by “à la vôtre” (to yours) – matching a “vous”. or even just “tchin-tchin” (cheers). Then we clink our glasses, take a sip, and put it down. Some French people won’t clink glasses if they are filled with water or non-alcoholic drinks. It’s a common superstition that you should only clink glasses containing alcohol… Not everybody respects that though, so just go with the flow. And of course, be gentle when you clink. It’s glass after all! It is standard manners for Frenchmen to fill the glasses of the women sitting next to them. Although this changes more and more, old manners dictate that a woman doesn’t help herself to alcoholic drinks. If there are only women at the table, then one will just pick up the bottle and serve everybody. But if there is a man around, it’s his job to do it. However, whomever serves a drink should never only pour their own glass, but always offer around, wine and water alike. In a fancy restaurant, a waiter would take care of filling your glasses. Reaching out to the bottle and doing it yourself may, or may not be OK, depending on how fancy the place. If you have to do it, it’s kind of pointing out that the waiter is not doing his job properly. Note that the waiter/host will keep filling-up your glass as you drink it. So if you don’t want anymore wine, just leave some wine in your glass – it will be spoiled, but it’s the way to signal you don’t want more. Wine in France is a religion. It’s meant to be savoured, so drink it slowly. We don’t fill-up the glass either, as to let the wine breathe. And we comment on our drink with an approving grin or a good French “Mmmm”. If you are a guest at a French house, then you shouldn’t say anything. The wine may not be to your taste but be to your host’s taste… And it would be rude to complain. When you drink red wine, there is a chance the glass will leave some red marks on the sides of your lips. If you see someone on a terrace in France drinking wine at 5 PM, chances s/he is a tourist. Or a French alcoholic. In France, drinking wine is linked to eating food. You seldom drink wine just by itself. Furthermore, French people have dinner around 7:30-8:30 PM… So before dinner drinks don’t start before… 6:30PM? It’s not set in stone, but there is definitely a time after lunch, and too early before dinner-time when it’s not really customary to drink alcohol in France. However, don’t let this tip prevent you from enjoying a glass of Chablis on a Parisian terrace one sunny afternoon: you’re on vacation, and you can do anything you want. French people won’t be particularly shocked either. I’m just pointing out this is not a very French thing to do. French people love beer as well. But beer is more like a before dinner drink, or something to have with a light lunch. If you went to a fancy restaurant, or when invited over at some French folks, drinking beer with your dinner is likely to be a faux-pas (unless you were eating specific food served/cooked with beer). If you don’t enjoy drinking wine, then, just drink water. French people love water as well, and will often have some fancy mineral water, sparkling (de l’eau pétillante) or still (de l’eau plate) ready for a dinner with guests. It’s not customary in France to drink a soda, milk or juices during dinner. You enjoy this tips? 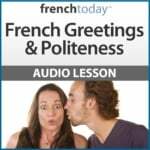 Learn both French language and culture in the context of a level adapted story: check out French Today’s downloadable French audiobooks. French Today’s bilingual novels are recorded at different speeds and enunciation, and focus on today’s modern glided pronunciation.